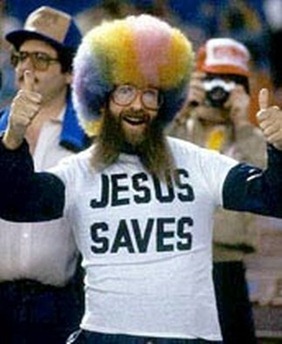 In the last "Rainbow Church" post we examined the sad story of Mr. Rollen Stewart; A.K.A., The Rainbow Man, who sported a rainbow colored wig at basketball and football games in order to garner televised coverage for his "John 3:16" sign. As I mentioned before, he was willing to resort to rather odd forms of behavior - even setting off smoke bombs at the '91 Master's Golf championship in order to attract attention. But eventually Mr. Stewart went beyond odd. His hunger for media attention finally went so far that he eventually resorted to kidnapping a cleaning lady at a Hyatt Hotel (Los Angeles CA) while posting a series of Bible verses in the window of the room that he had seized. When he was captured by the police, they apprehended Stewart's infamous blue, red, yellow, green, purple and pink Afro wig, along with a high caliber pistol, various incendiary devices, three days of food and Bibles, religious tracts and poetry. According to Stewart, all that he wanted to do was to tell people about the Love of God; but because he was willing to resort to foolish and ungodly means in order to grab the world's attention, he ultimately made the world more suspicious of people who call themselves "Christians." Now there's a thought: people employing foolish and ungodly means in order to grab the world's attention - this is why I referred to Mr. Stewart as the official mascot for much of contemporary "evangelicalism." The chief end of God is to glorify man, and enjoy him forever. Or in other words: "It's all about me!" After all, if the singular message of the Gospel is that God loves us and wants us to be happy then one must conclude that "It's all about me!" In such a system of self-centered thought as this, every aspect of life must be governed by a revised trinitarian doxology of me, myself and I. Sadly, this is the modern message of love. It is a form of love that is governed by what the worshiper wants and desires. His passions formulate the true center of life and devotion, and therefore his Church must conform itself to his man-centered standards, or else suffer immediate rejection for the next passing fancy. Yes indeed - this is where much of the modern church is today; but sadly, this struggle has been around from the very beginning. You see, this concept of love, where the worshiper is deemed to be the chief end, is the same concept of love that was prevalent in the days of the early church. This concept of love was not philos, nor was it agape love. Instead, this form of self-centered love was called eros love - and it is here with us today. "What the Greek seeks in eros is intoxication, and this is to him religion. To be sure, reflection is the finest of the flirts which the heavenly powers have set in the heart of man (Soph.Ant., 683 ff. ); it is the fulfillment of humanity in measure. More glorious, however, is the eros which puts an end to all reflection, which sets all the senses in a frenzy, which bursts the measure and form of all humanistic humanity and lifts man above himself. It is a god, and he is powerful even above the gods...All the forces of heaven and earth are forces of second rank compared with the one and only supreme power of eros. No choice is left, nor will, nor freedom, to the man who is seized by its tyrannical omnipotence, and he finds supreme bliss in being mastered by it." Theological Dictionary of the New Testament. 1964-c1976. Vols. 5-9 edited by Gerhard Friedrich. Vol. 10 compiled by Ronald Pitkin. (G. Kittel, G. W. Bromiley & G. Friedrich, Ed.) (electronic ed.) (Vol. 1, Page 35). Grand Rapids, MI: Eerdmans. "Marriage, which had once been a lifelong economic union, was now among a hundred thousand Romans a passing adventure of no great spiritual significance, a loose contract for the mutual provision of physiological conveniences or political aid." (Will Durant, The Story of Civilization, Caesar and Christ, p. 363). When I first read this description of marriage in 1st century Rome, I couldn't help but to think that Durant was describing our secular world today. How much of what is passed off as "love" is really a false imitation that is governed by one's own self-centered desires. You have heard the expression, "If it feels good...do it!" This isn't at all new, rather it is the very same philosophical ideal of eros love that has continued to gain momentum in America and throughout the world. Worse yet, it is a view of life that has crept in unnoticed within the walls of the modern church, to such an extent that such self-centered passion is now passed off for the Bible's true message of genuine love. In many ways the modern church is like the ancient church at Corinth. The Corinthians had become grossly overrun by the Graeco-Roman culture to such an extent that they were willing to embrace the "wisdom" of men over the Gospel itself (1 Cor. 1:18-31, 2 Cor. 11:1-4). Their worship services had become selfish, self-centered events which made a mockery of the Holy Spirit, and therefore the Apostle had to reprove them of their childishness (1 Cor. 14:20) by reminding them that the church is to labor for the common good that is in Christ (1 Cor. 12:7), rather than for the self-seeking desires of men. But most of all, Paul taught them that all things must be done out of agape love (1 Cor. 13) - or all is lost. His gentle but firm correction is as needful today as it was back then. The Corinthians were conducting themselves out of the selfishness that is characteristic of eros love rather than agape or philos love. Paul had to inform them that genuine love does not seek its own - unlike the ideals of the world around them. In a sense Paul was saying to them: "I realize that the world says - 'If it feels good, do it!' But this is not the way of the Christian!" There is a great difference between the concepts of eros love and agape or phileo. These latter two terms were carefully preserved by the New Testament writers in order to show that the love of God is a transcendent reality that goes far beyond the shallow affections of this world. In the third installment of "The Rainbow Church" I will cover these important terms in greater detail. They are indeed crucial terms, for they establish a clear distinction between the conduct of the children of God versus the children of the devil who live for their own appetites.